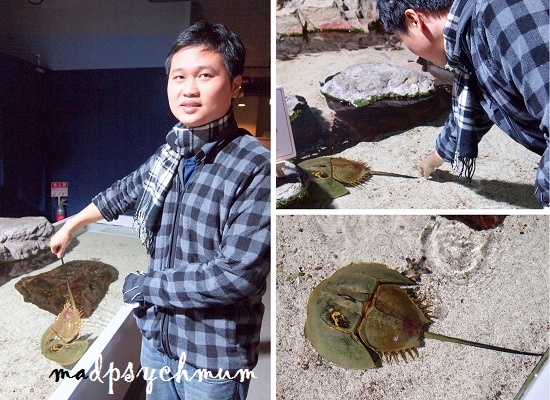 After breakfast, we visited Noboribetsu Marine Park, which was a themepark and an aquarium combined into one. By the time we reached the park, it was snowing heavily (the snow did follow us after all!) so the rides were not opened. 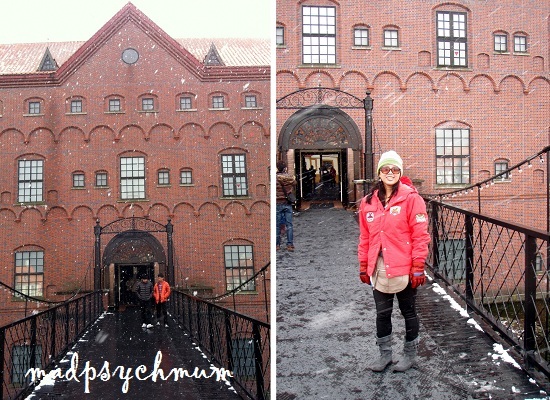 We then made our way to the aquariums, which were housed within a replica of the Danish Nixe Castle. 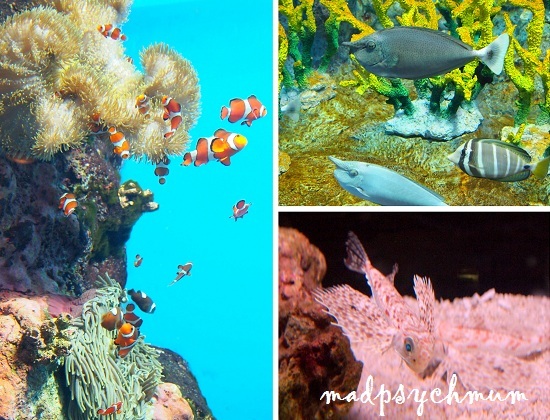 The aquariums were home to many different sea creatures. Some were beautiful and magnificent while others were plain weird. 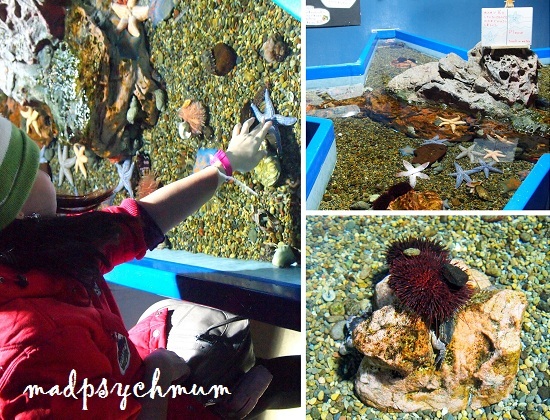 We also got to interact with some of the animals at their "touch" pools. 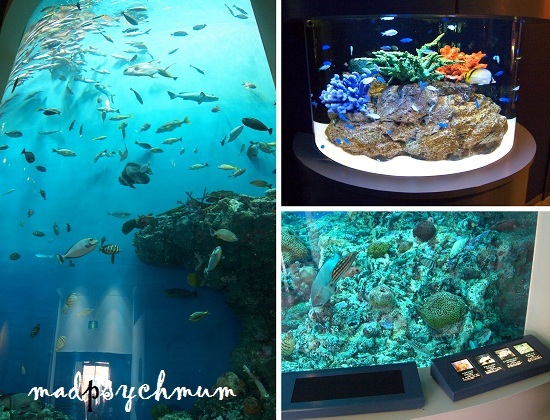 We also managed to get a bird's eye view of the main aquarium, where the big stingrays and sharks were kept. The view from the tunnel under the aquarium (similar to Singapore's Underwater World but much shorter) was less impressive though. As the shows were about to begin, we rushed through the rest of the exhibits in order to make our way for the Dolphin & Sea Lion shows. The charismatic sea lion smiling at the audience.. so cute isn't he? The shows were quite similar to the ones at Ocean Park in Hong Kong, Dolphin Lagoon in Sentosa and the Singapore Zoo. As the hubby and I have been to so many of such shows than we can count, it didn't really impress us very much. 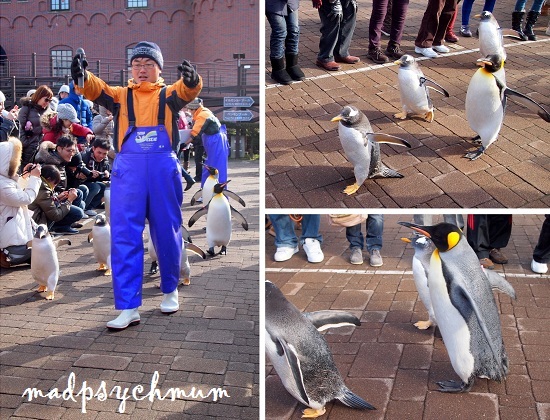 What we did find interesting was the Penguin March, where the emperor penguins were allowed out of their enclosure to walk in the main parade square. It was freezing cold but all of us still persevered against the cold winds in order to see them up close and personal. When it finally got too cold to hang around the park, we proceeded on for lunch. We were particularly excited because it was served at a seafood restaurant. The hubby's eyes immediately lit up like the break of dawn. He was in heaven! 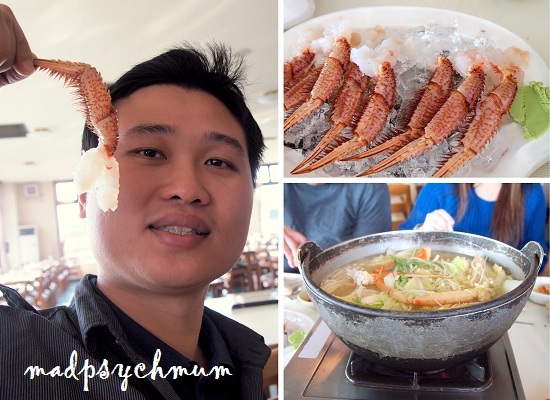 Oh I forgot to mention that it's the hubby's birthday today so he was adamant to splurge on the very best seafood as his birthday present to himself. 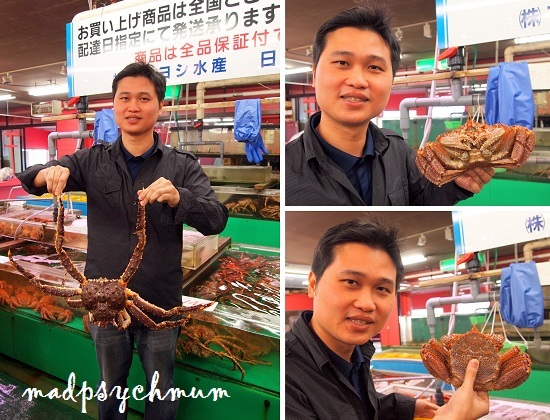 He decided on getting the hairy crab instead of the king crab and it cost us almost S$200!! *gasp* It was the most expensive crab we have ever eaten! 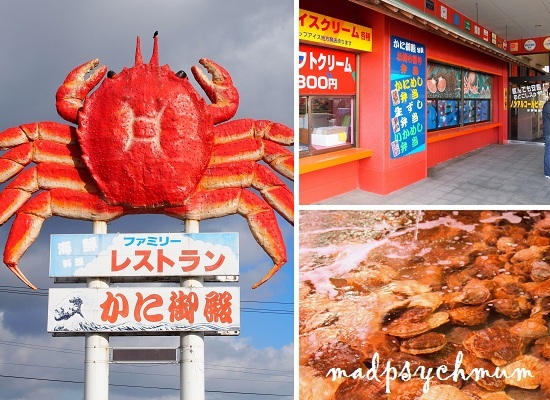 The hubby finally had his seafood extravaganza that he had been looking forward to since the moment we set foot in Hokkaido =) After a very satisfying lunch, we continued our journey to Jigokudani, translated as “Hell Valley” due to the sulphurous boiling ponds that it is known for. 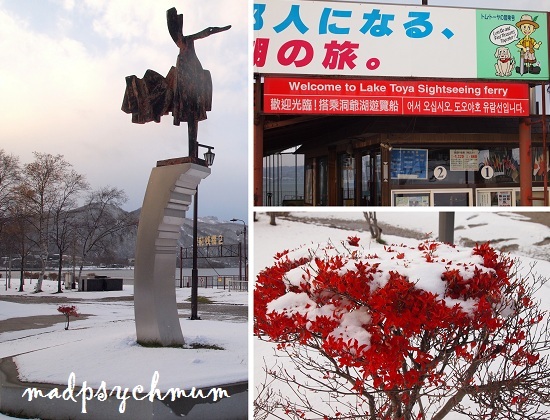 We also visited Lake Toya, which was surrounded by beautiful forests and majestic mountains. This lake is unique as it never freezes, not even during the icy cold winter, due to the geothermal activity in the region. 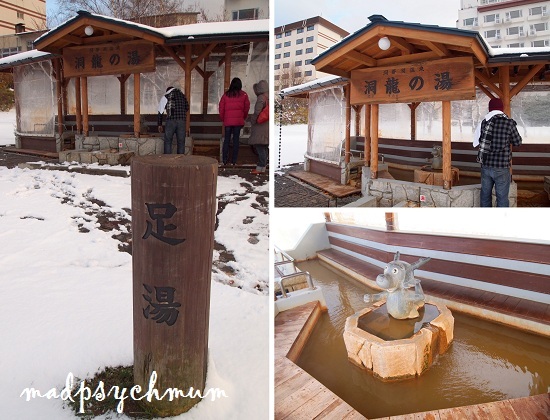 One of the main attractions here is the Ashiyu (translated as "hot foot spa"), which was essentially a small wading pool filled with water from the hot springs. 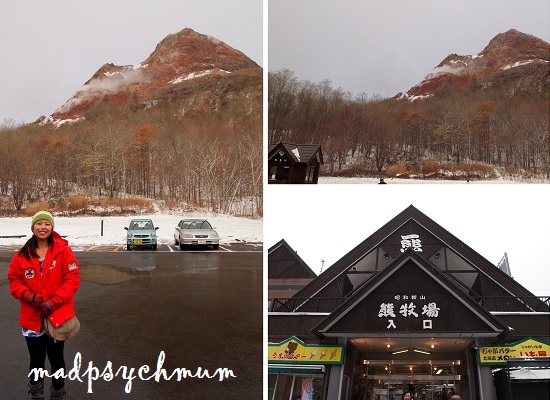 While you are soaking your feet in the warmth, you could also admire the surrounding mountains such as Mount Showa (formed after 2 years of volcanic activities) and the beautiful Uzu Zan Volcanic Mountains. And with that, we conclude our sightseeing journey! The rest of the evening was spent shopping at the streets of Sapporo near our hotel. 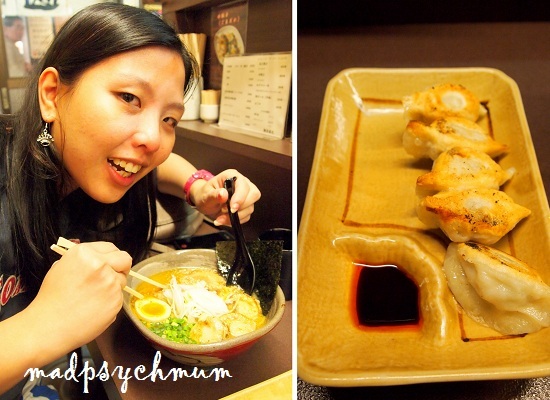 But before we could finish our shopping, our stomachs were calling out to us so we went on a hunt for the Susukino “Ramen and Entertainment” Street as recommended by Ai san. 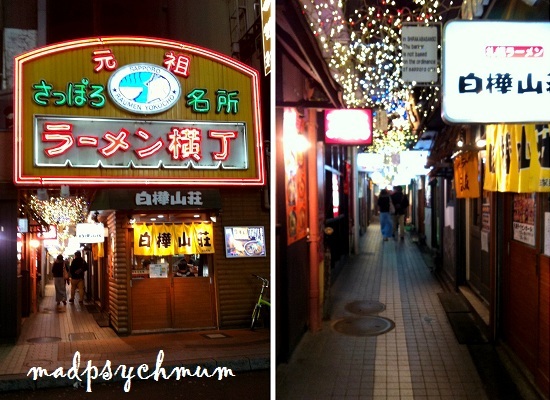 It took a bit of searching but we eventually found the small alley hidden among bigger shops. There were many ramen shops but the hubby decided to go with his instinct and settle for this one, whose chef looked half-American but spoke fluent Japanese. I was sure he could understand what we were saying though. After we had placed our order, he went right to work preparing it for us. Japanese chefs believe in putting your heart and soul into your cooking so the food is always prepared meticulously. Our ramen is finally ready! Continue to >> Day 7: Sayonara! My Reflections..